Blog - Drinking Coffee in Style with Royal Crown Derby. Drinking Coffee in Style with Royal Crown Derby. Here at Royal Crown Derby we love enjoying a luxury cup of the finest coffee using handcrafted fine bone china. 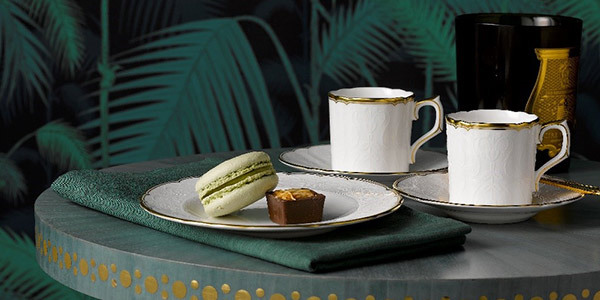 Take a look at a special selection of Royal Crown Derby designs perfect to indulge in an opulent coffee break. 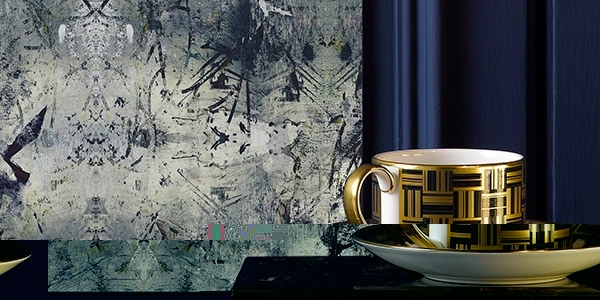 Bold contemporary patterns create a truly elegant coffee drinking setting. 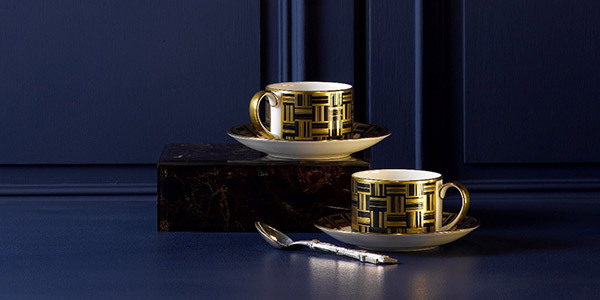 The stylised art deco inspired Broadway pattern in stunning 22 carat gold mixed with platinum raised paste and black, featuring geometric and angular designs which perfectly reflects the grandeur of the 1920s, creating a spectacular setting to enjoy your mid-morning coffee in style. Satori Black uses bold symmetrical designs representing longevity and a harmonious life, mixing Eastern and Western cultures and traditions to create this stunning contemporary tableware pattern. 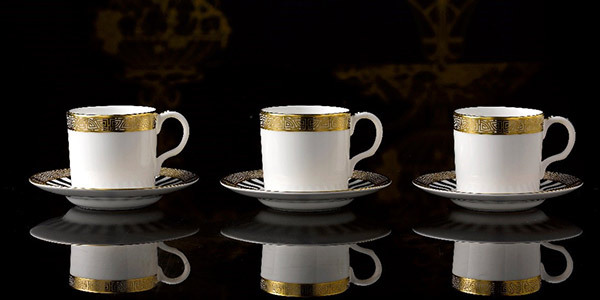 The strong black surface design contrasts beautifully with the 22 carat gold embellishment adding a perfect opulent touch to enjoy a luxury coffee drinking experience. Showcasing the stunning beauty of fine bone china, Royal Crown Derby’s Darley Abbey Pure is an elegant white on white textured design adapted from the 18th Century archival Darley Abbey pattern. Using the damask border design representing twirling foliage and filigree leaf designs. Finished perfectly with 22 carat gold or platinum banding for a truly elegant setting to enjoy your coffee. View Satori Black tableware here. View Darley Abbey Pure tableware here.